Grace Flaherty had given up hope of ever seeing her husband again. After all, it'd been over a year since he went missing in combat. So when he strides through the door of her bakery in downtown Christmas one sunny afternoon, she can hardly believe her eyes. But her happily-ever-after is going to take some effort - because Jack has no memory of his family. All Jack Flaherty remembers about Christmas is that he couldn't wait to leave town. Now he's a local hero with a wife and son he doesn't know. Even as he struggles to rekindle the romance with his wife, he knows in his heart what he wants: a second chance at love. "CHRISTMAS IN JULY was such an enjoyable book for me, and certainly no surprise that it was coming from this very gifted author. 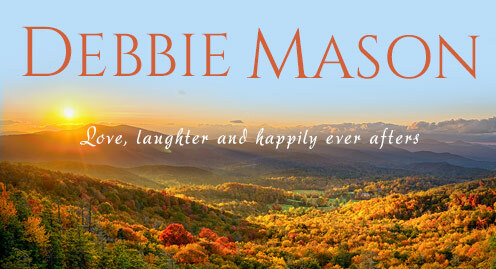 I have read many of Debbie Mason's stories and loved each and every one of them. Writing about everyday people and the love they share when a hiccup occurs, gives us some of the best reading around. This is book two in the Christmas Colorado series. I can't wait for the next story in this series. These are definitely "good feeling" tales to remember for a long time to come." "These characters are well developed, well rounded and realistic. They display many human traits, both positives and negatives, just like we all do. The secondary characters added another delightful level to the book. The small town setting is realistically described, and the setting, combined with the characters, makes me want to go there for at least a visit, if not to live. I would recommend this book to anyone who enjoys a well-written romance. Also to anyone who enjoys a heartwarming, feel good story." 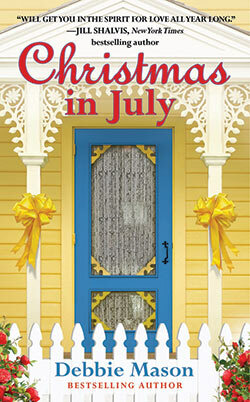 "Christmas in July is one of those books that will make you feel. You will feel for each of the characters for different reasons. One moment you will be feeling so sad for one of them and the next thing you know that would change. It will get to the point that you will end up feeling such a connection with some of the characters that you will find tears in your eyes because of the struggles they are going through. . . I just loved this book. It captured me from the very beginning and I had a hard time letting go when it ended." "4 Stars! A quintessential romance with everything readers love: familiar and likable characters, clever dialogue and a juicy plot." "Despite the many crises that Jack and Grace must endure on their way to happily ever after, Christmas in July is a delightfully angst free novel. The characters are vibrantly developed and the problems they must overcome are believable and true to life. The small town of Christmas is realistically depicted with a wonderful spectrum of caring and somewhat colorful townspeople. This incredibly heartfelt and deeply moving romance is an outstanding addition to Debbie Mason’s Christmas, Colorado series that old and new fans do not want to miss."